Since 1982, countless clients from all walks of life have trusted Steinberg Injury Lawyers' team of experienced personal injury attorneys to provide them with the compassionate representation they need and deserve after a serious car accident. Our stellar legal team is committed to ensuring that you and your family receive the largest possible financial award in the shortest possible amount of time, so you can secure quality medical treatment for your injuries, repair or replace your damaged vehicle, and start getting your lives back on track. We provide our clients with first-class, respectful service at all of our five Los Angeles area law offices, and can even arrange to meet with you in your home or at the hospital. We treat you the way we'd like to be treated: answering your questions and keeping you informed of all the latest developments in your case, so you never have to feel like you're left in the dark. Best of all, we won't charge you a dime until your case is resolved. Being involved in a car accident can be a frightening and confusing experience that can leave victims unsure of how to proceed. While this confusion is perfectly understandable, missteps that occur in the minutes, days, and weeks following the crash can have a negative impact on the outcome of your car accident case if you decide to pursue compensation for your injuries. Taking these steps after a car accident can help you—and your personal injury attorney—build a strong case. Stay at the scene of the accident, even if the injuries or property damage seem minor, and you believe the other driver was at fault. Check all drivers and passengers for injuries, and summon an ambulance, if necessary. Call and report the accident to the local police department or the California Highway Patrol, depending on where the accident occurred. Make sure to request a copy of the police report, so that you have it for your insurance company, attorney, and personal records. 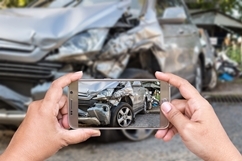 Use a digital camera, or the camera on your cellphone, to document the accident scene. Take photos that show the condition of the road, as well as the positions of the vehicles involved, and any property damage or injuries. Exchange contact and insurance information with the driver of the other vehicle (or vehicles). It's also important to get contact information for the passengers in the involved vehicles, as well as any witnesses at the scene. Call your insurance company to notify it of the accident. Failure to report the accident to the insurance company, or cooperate in their investigation, may result in your claim being denied. Don't accept or place blame for the accident by apologizing or making accusations. Doing so may hurt your car accident case if you choose to pursue compensation for damages. Seek medical attention right away, even if your injuries don't appear to be serious. You may not feel the full extent of your injuries right away and, if you wait to seek treatment, the other driver's attorney may claim that your injuries are not related to the accident. Having a qualified medical professional document and treat your injuries can only strengthen your case. Secure legal representation. Hire an experienced and trustworthy car accident lawyer or personal injury attorney to represent you. If you were injured in a car accident, you likely need the assistance of a car accident lawyer. Your injuries could be physical, emotional or both. Depending on the severity, your injuries may also extend to your work or personal life. Another question you need to ask is whether your injuries were caused by another person or entity. This is where California state laws, police reports, witnesses and insurance company investigations come into play. If an investigation seems to be moving slowly, this may be a sign that you should hire a car accident attorney. Lastly, you will want to consider your “damages.” This not only includes your vehicle but also your medical bills, physical and emotional suffering, lost wages, diminished quality of life and more. After you’re involved in a car accident, dealing with a combination of these factors quickly becomes overwhelming. By giving us the full story and letting us compile your medical records, we can determine the strength of your personal injury case. The car accident settlement process can be complex and lengthy, and most accident victims can benefit greatly from having a knowledgeable legal representation such as a car accident attorney. The settlement process begins when you gather information at the scene of the accident and ends when you receive a check compensating you for damages. The next step of the settlement process is to submit the information you gathered—along with an explanation of the accident, the ways it's affected your life, and the amount you'll accept to settle—to the insurance company, who will evaluate your claim and contact you to negotiate. A skilled personal injury attorney can help ensure you receive a settlement that's fair and can take your case to trial, if necessary. A number of factors can impact your car accident claim, including the types of insurance that you and the other driver have. The cause of the accident can also play a role. There are many reasons to consider hiring car accident lawyers for your car accident, including claims involving minor to serious injuries, multiple parties or complex negotiations. Neck injuries – Such as whiplash. Brain and head injuries – Such as concussions and traumatic brain injuries. Back injuries – Such as disc injuries. Facial injuries – Such as lacerations, bruises, and fractures. Psychological and emotional injuries – Such as depression, anxiety, and post-traumatic stress disorder. If you sustained these or other injuries in a car accident, you may be facing a long and difficult recovery. Uninsured vs Underinsured In California: What’s the Difference? When you’re involved in a car accident, you can expect to be hit with some costs. What you don’t expect is to end up in a worse place financially after an accident you didn’t cause. Furthermore, you definitely didn’t expect to use your own insurance policy. This is a real possibility when someone hits you and they’re uninsured or underinsured. Uninsured is when someone carries no insurance at all or carries an amount less than that required by California law. This means they won’t have enough coverage to pay all of your injuries and damages to your vehicle. You will have to file an uninsured motorist claim under your own policy. Underinsured drivers have the minimum required coverage under California law but still don’t carry sufficient coverage to pay fully for your damages. This is common in severe accidents where damages are high or where multiple vehicles are involved. If you find yourself in either one of these scenarios, you might consider hiring a car accident attorney. It’s important not to settle too quickly or sign a release without consulting an experienced attorney. California's statute of limitations strictly limits the amount of time a plaintiff has to file a lawsuit. The statute of limitations for car accident cases is two years, meaning that you have two years—from the date of the accident—to file your suit. However, if you only want to pursue compensation for property damage to your vehicle, the statute of limitation extends to three years. Car accident victims who allow the clock on the statute of limitations to “run out” forfeit their rights to pursue a legal remedy. Hiring a personal injury or auto accident attorney to represent you in a car accident case is an extremely important decision that shouldn't be taken lightly. The car accident lawyers you choose will have a significant impact on the outcome of your case, so it's essential to choose a skilled attorney you can trust. At Steinberg Injury Lawyers, our seasoned attorneys have extensive experience handling car accident cases just like yours. Contact us today for a free, no-obligation evaluation of your case accident case to see what we can do for you.